I hope you enjoyed St. Patrick's Day. Here's an Irish science connection that you may not have known about. 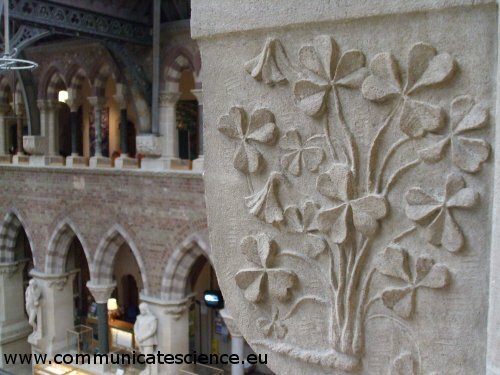 The wonderful Natural History Museum at Oxford University is a must visit for science fans everywhere. But did you know about the important Irish links to the building? The museum building was completed in 1860 and was designed by the Irish architects Thomas Newenham Deane (who was born in Cork) and Benjamin Woodward (who was born in Co. Offaly). Deane and Woodward also designed the museum at Trinity College, Dublin. Stone columns made from different British and Irish stone are a significant feature of the neo-gothic design. Statues of some of the greatest scientists, stand around the ground floor but much of the planned stone carving around the interior remains incomplete. Although the university was happy to pay for the construction, the ornamentation was paid for by public subscription. Irish stone carvers O'Shea and Whelan (from Ballyhooly, Co. Cork) were employed to carve the interior but money ran out before they could finish the job. Although they offered to do it for free, the university management accused them of "defacing" the building by doing some of this unauthorised work. Some people suggested that the stone carvers responded by caricaturing the university management as parrots and owls in the carving over the main entrance. The carvers were forced to remove the heads and they remain headless to this day!